Hair is familiar and normal. It's something people experience on themselves and view on others every day. It belongs to the body--a natural extension of the person who 'wears' it. Disconnect human hair from the body, however, and it becomes its own entity, no longer identified with the person who grew it. Its materiality, its there-ness, hints at what is not there - the body of its previous owner. Unattached to its place on the scalp, disembodied hair can be repulsive. But it is also compelling; human hair is of nature, of corporeality, of mortality. It has a living history. As an artist's material, human hair is simultaneously fascinating and unnerving. Band of lace from the Victoria & Albert Museum, circa 1640 - 1680. From the 19th into the early 20th century in the U.S. and Europe, it was a normal and everyday practice to give cuttings of one's hair as tokens of affection, or to place hair cuttings into mourning jewelry as a remembrance of a loved one who had passed away. 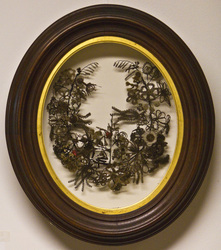 Creating art from human hair dates back in the European tradition to at least the mid-17th century, as seen in this band of lace circa 1640-1680 from England in the Victoria and Albert Museum, which may have been a bracelet given as a token of love. 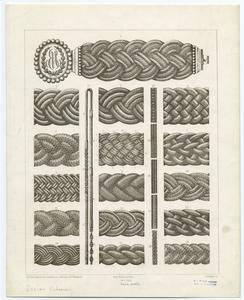 Hair work designs by P. Florentin, circa 1870. In the hands of Victorian men and women, hair cuttings were transformed into ornate 'handicraft' objects and high-end jewelry. Although the practice died away as photographs became the preferred means for remembering a loved one, there are a handful of artists today who have re-enlivened the tradition and Victorian hair art is now a highly collectible item. One of the most oft-cited 'strange' museums in the U.S. today, Leila's Hair Museum in Independence, Missouri, boasts a collection of over five hundred human hair wreaths and two thousand human hair jewelry pieces, mostly from the Victorian era. The detail and artistry in some of the pieces is astounding. Victorian hair wreath at Leila's Hair Museum. For most people in the modern era, hair art means the practice of cutting, shaping, twisting, tweaking and spraying hair, to create a style while the hair remains on the head. Hair design in this sense can be an art, and hair designers and fashion designers in the past decades have utilized hair to create 'looks' to accentuate fashions or body's silhouette. Self-styled "avante garde" hair designer Nicholas French fashions hair into sculptural forms that could stand on their own as pieces of art, but instead poise on the heads of fashion models. 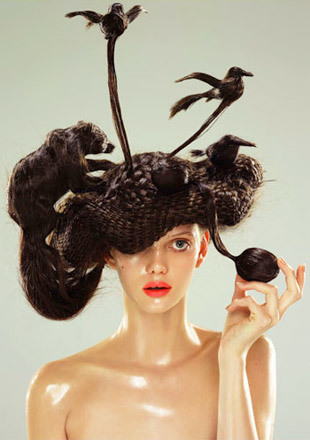 The Japanese art director/designer Nagi Noda, before her untimely death in 2008, took the idea of hair design into the wearable art realm with her hair hat sculptures of animals and other objects. Artist Shoplifter, aka Hrafnhildur Arnadottir, has experimented with hair art sculpture both on and off the body. Her collaborations with other artists have led to innovative pieces, including work produced with Bjork for her album Medulla. Hair piece by Shoplifter for Bjork Medulla project. Hair hat by Nagi Noda. There are a number of contemporary artists utilizing human hair as a material all on its own, independent of the human head. After Hurricane Katrina, artist Loren Schwerd expanded the Victorian concept of hair as a symbol of mourning for lost loved ones in her series Mourning Portrait. 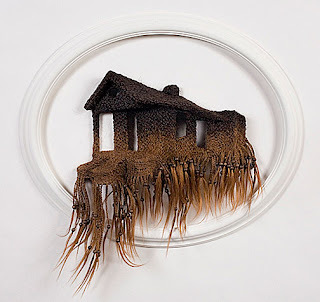 Her sculptures, made of human hair extensions that she found outside a beauty store in the Ninth Ward, depict houses abandoned after the hurricane. Adrienne Antonson, fashion designer and artist, has been prolific in her series of human hair sculptures, which includes insects, abstract works, and pieces resembling everyday objects like scissors or a magnifying glass. In some sculptures the material is more subtle, while in others, such as a pair of gloves, the hair makes its presence well-known. 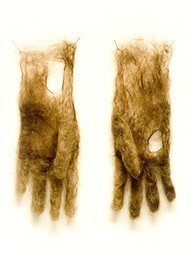 Human hair sculpture by Adrienne Antonson. Human hair offers unique properties as a artist's material. 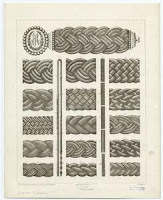 Long and thin, hair is a natural fiber that can be woven, stitched and manipulated. Hair can be used as raw and rough single strands, or put together as waves of flowing shiny bands. 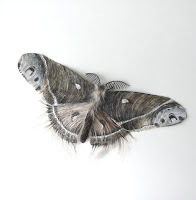 Both Jenine Shereos and U.K. artist Kerry Howley, utilize the fineness and tensile strength of human hair to create works of intricate detail. For her Leaves series, Shereos hand stitched and knotted strands of hair onto a water-soluble background that was then dissolved to leave the delicate pattern of leaf skeleton. 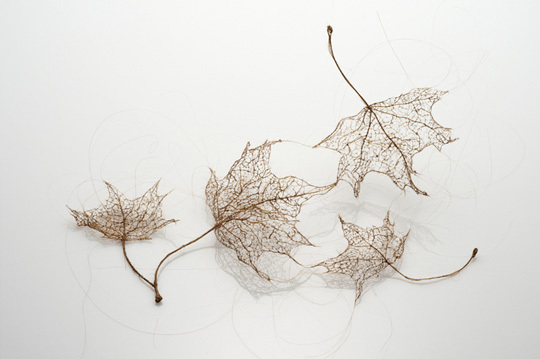 Leaves, 2010, by Jenine Shereos. Photo by Robert Diamante. Howley's hair necklaces recall the fine Victorian hair work in a form both beautiful and modern. When displayed on the body, they appear to be a natural part of the human form, or a living tattoo. Hair necklace by Kerry Howley. Fascinating and potentially distasteful, hair is a material that will stay with us, whether on the head or off. As a material, it will likely continue to draw the interest of the artist and viewer alike, whether that person is a lover of historical hair work or an explorer of the realms of contemporary art.